Don’t forget to check out our Facebook page where we are also able to share interesting information and images from other organisations and groups as well as upcoming events. This article on St. Patrick’s by Heather Knight was originally published in the first edition of our newsletter, Kilmore Connections, in Sept. 1999. The Catholic parish of St. Patrick’s, Kilmore was established in 1849 and is the oldest inland Catholic parish in Victoria. The first priest, Fr. Charles Clarke took up his appointment on 21st April 1849. At the time, the parish was much larger than today and the Kilmore circuit included Gisborne, Woodend, Kyneton, Castlemaine, Eaglehawk, Echuca, Wodonga, Mansfield, Woods Point, Warburton, Donnybrook and of course Kilmore. Today the parish is a shadow of its former self and covers 600 square miles, from Kalkallo to halfway between Broadford and Tallarook and from Strath Creek in the east to Pyalong in the west. Prior to the appointment of Fr. Clarke, it is believed that Fr. Ward from the parish of St. Francis (Melbourne) attended the needs of the Catholic members of the Kilmore community. The records of St. Francis show that masses were held in private dwellings in Kilmore prior to a church being built. Fr. Clarke soon set about collecting funds to build a church and parsonage. 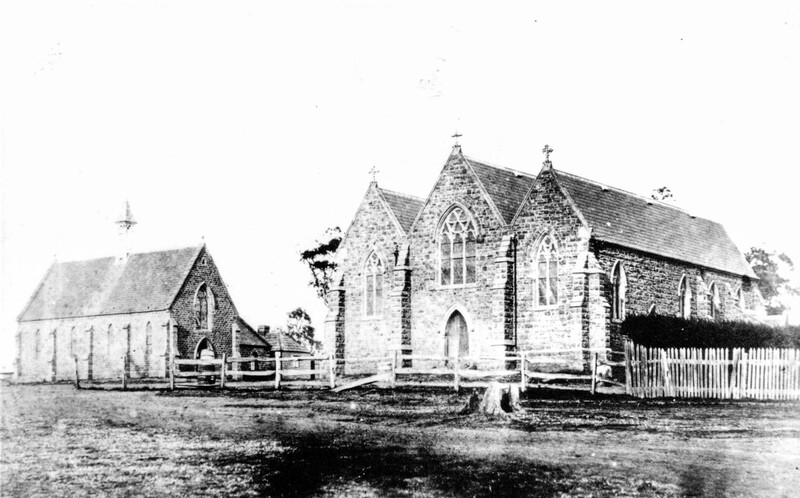 However, a dispute arose as to the future location of the church between the Lands Department, who wanted the parish established at the Survey, (Willowmavin) and Bishop Goold, who insisted on the originally proposed Kilmore location. In the meantime, a temporary wooden church of paling slabs and shingles was built on Brewery Hill sometime between 1850 and 1854. In January 1854, Fr. Clarke resigned, possibly because of a dispute over the planned church-school. He died three months later in Melbourne on April 21st 1854 and was buried in the Melbourne General cemetery. Fr. Timothy O’Rourke succeeded Fr. Clarke in 1854 and initiated the building of a bluestone church-school. This building, used as a boy’s school, had two large rooms with extra small rooms for a master and a school- mistress. Rev. W. M. Finn passed through Kilmore sometime in 1869 or 1870 and was impressed by the school, he commented that, ‘The school house is a building of large size, and one that scarcely has an equal outside Melbourne’. In later years the boys’ school was handed over to the Sisters of Mercy as a primary school. Condemned by health authorities, it was unfortunately demolished in 1956. At the time of its demolition, the bluestone building had two classrooms and was run by the Marist Brothers for primary school boys. The present parish centre was built on the foundations of the old church building. There are varying opinions as to whether this building may also have been used as a church. About 1855, under Fr. O’Rourke’s supervision, a small, solid bluestone church, known as St. Bridget’s was built at the Survey on 2 acres of land donated by George Jessop. Maher states that the church was used for services for two years before being blessed by Bishop Goold on 1st November 1857. St. Bridget’s was short lived however. When the Gavan Duffy Land Acts were passed in 1862, many of the tenants on the Survey left the area to select land in the north- eastern district. St. Bridget’s fell into disrepair and was closed. Bluestone from this church was later used to build the first section of the Sisters of Mercy Convent in 1873 (now Assumption College) and the statue of St. Bridget now stands in St. Patrick’s church. At the centre of the parish’s activities today is the magnificent edifice that is St. Patrick’s Church. The bluestone church sits at the head of Rutledge Street, which provides the impression of a grand entrance. On the north side stands the presbytery and on the south side, the parish centre, where once the original bluestone church -school stood. St. Patrick’s Church was begun in 1857 under the watchful eye of Fr. Timothy O’Rourke. The church is built of bluestone in the Gothic-Early English style and was designed by English architect Charles Hansom and executed by local architects. Mr. Sutherland of Melbourne was the builder. The foundation stone was laid on the 23rd of August, 1857 by Bishop Alipius Goold, and the church was dedicated and opened for services on 8th July 1860. Extensions to the church were made between 1869 and 1871 under Fr. Branigan, who unfortunately did not live to see the completion of the work begun under his care. Bishop Goold blessed the church on March 6th 1871, nine months after the death of Fr. Branigan. The extensions were completed by Fr. Farrelly, who added the sanctuary and installed the altars. The High Altar was erected as a memorial to Frs. Branigan and O’Rourke. The High Altar was designed by W. W. Wardell, the architect of both St. Patrick’s and St. Mary’s cathedrals and carved by Messrs. Farmer and Co. of London who also constructed the Lady Altar. Both Fr. O’Rourke and Fr. Branigan are interred in front of the Lady Altar. The total cost of building St. Patrick’s was estimated at between 10000 —12,000 pounds, the cost of the High Altar was 1200 pounds and the side- altar 800 pounds. The stained glass window over the High Alter depicting the life of Jesus was completed at the Melbourne factory of Ferguson and Urie. An extremely handsome building in its day, the presbytery featured turned wooden verandah posts and exquisitely delicate lace work on the verandah. Unfortunately, in the 1950’s rush to modernise and renovate, the lace work was removed and the wooden posts were used in the stable at the rear of the presbytery; the stable has since burnt down. Other buildings in the St. Patrick’s parish, many of them instigated by Fr. Branigan included churches at Pyalong (1860), Heathcote (1862), Dabminga (1864), Tallarook (1865), Euroa and Romsey (1868), Emu Flat (1872) and Seymour (1873), Broadford (1887, Strath Creek (1888) and Wandong (1891). There were also schools built at Big Hill, Bylands, Pyalong, Moranding (1858), Tallarook (1864), Forbes (1865), Lancefield, and Reedy Creek (1866). Fr. Farrelly was the longest serving parish priest of Kilmore, serving for 36 years until his death in 1906. Monsignor Morrison served 25 years and the present Fr. Rankin has spent 22 years as parish priest in Kilmore. Brochure to commemorate the 130th anniversary of St. Patrick’s Parish. Glimpses of North Eastern Victoria, By Rev. W.M. Finn, First Published by Catholic Bookselling 1870, Lowden 1971. Some of the Fruits of Fifty Years, Ecclesiastical Annals, Publisher A.H. Massina & Co. Melb. 1897. Victorian Churches, National Trust of Australia, Miles Lewis Ed. 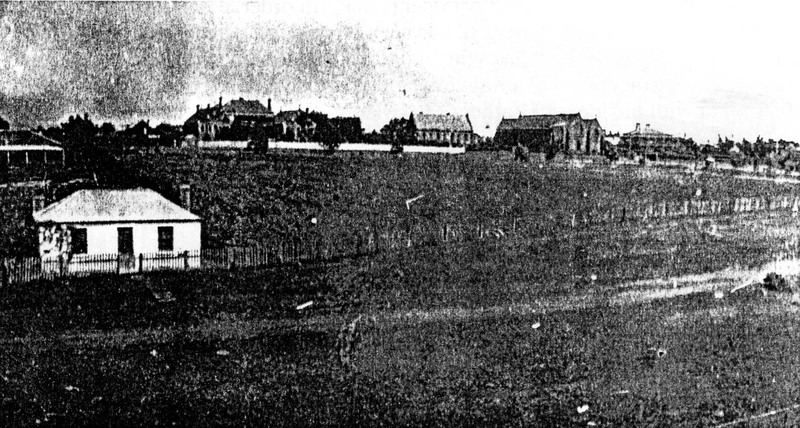 Assumption College, Primary School, Church and Presbytery 1920. The white cottage in the front was the Gerraghty home and the cottage behind, the home of the Malonys.